Want to be notified of new releases in JorgePe/microbit? The BBC micro:bit is a small ARM-based embedded system designed for Education. It has a few sensors, LEDs, buttons and GPIO pins and can be used through USB or Bluetooh Low Energy. This is a quick demonstration of how we can use a LEGO MINDSTORMS EV3 to communicate with a micro:bit through BLE. Will just how to present something in the the LED Matrix and read the two buttons but is very easy to use all the onboard devices. 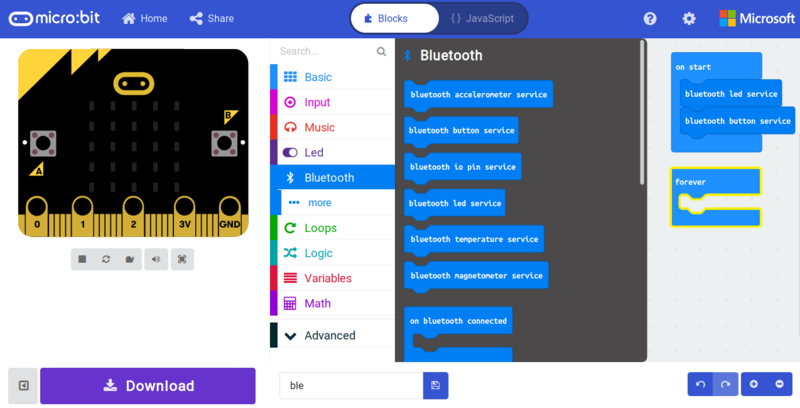 Just save the project and upload the '.hex' file to the micro:bit, it will start almost immediately to announce itself as a BLE device named 'BBC micro:bit [zuvat]'. If you have Nordic nRF Connect App you can already control the LED Matrix or read the buttons' state with it. We need a python library that supports BLE. Currently ev3dev includes pybluez ang gattlib buth it doesn't work with the micro:bit so I added pygatthttps://github.com/peplin/pygatt. it will take a while so be sure to have fresh batteries or a wall adapter charging a EV3 battery. Now just transfer the demo01.py python script to your EV3, connect a Medium Motor to port A and you should control the motor with short presses of Button A or B (longer presses will not work because they return different codes). I had to use the LED Matrix handle instead of the UUID because pygatt complains that no characteristic is found that matches it. The handle is 0x27 but it can change with future versions of the firmware (you can check the actual handle with the Nordic nRF Connect App or with a tool like 'gatttool'). As you probably noticed in the video, the responsiveness to the buttons is bad. Yes, EV3 hasn't the faster processor of h world but the micro:bit BLE services also don't seem much fast. So how can this be useful? I started using BLE gadgets as a way to get sensory data. With the EV3 that's a way to get extra sensors without additional connections, some times even sensors that aren't available in LEGO world. Most of the time, we don't need real time access to the data - 1 to 10 samples each second are usually enough. So how can we use the micro:bit for that? For onboard sensors, like the buttons or the temperature sensor, there are already BLE services that expose that data. 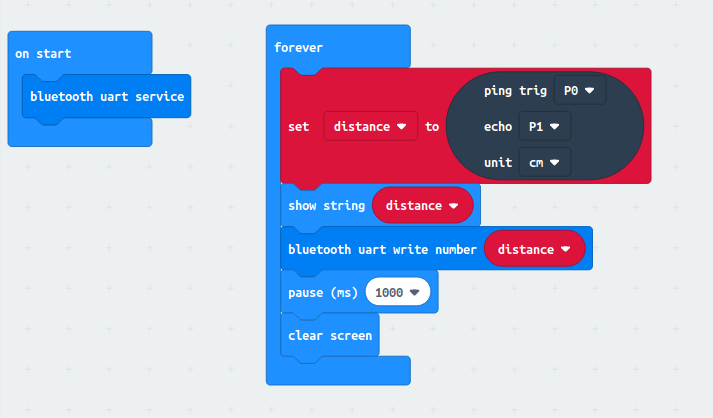 But since the micro:bit also has several GPIO pins available, we can also use external sensors and expose the data through the micro:bit' BLE UART Service. The HC-SR04 ultrasonic sensor is quite common among Arduino users and can also be . The Makecode online editor already has a 'sonar' extension for it so the resulting program is quite simple - just read the value from the sensor once per second, display the result on the LED matrix and also send it over BLE to whoever might be listening. On the EV3 side we just need to connect to the micro:bit and then subscribe to the micro:bit BLE UART TX characteristic in indication mode so that everytime the micro:bit sends a new reading we will receive it. pygatt.exceptions.BLEError: No characteristic found matching 6e400002-b5a3-f393-e0a9-e50e24dcca9"